Right now my husband and I are on vacation so I’m going to keep this short, but I want to share something with you that I learned yesterday about God, and chickens. When it comes to our childhoods, Ike and I had very different experiences. I was a “city girl,” and he grew up on a farm. For pets, I had two hamsters and a dog. Ike also had a dog (or several), as well as sheep, pigs, goats, and a couple of emus thrown in for good measure. His home videos are hilarious. There is one of Ike standing in a diaper with a bottle in his hand, surrounded by a cluster of sheep that kept bumping into him as he tried to figure out what was going on. He was probably 2 or 3. My home videos usually took place at birthday parties and Disney World. All of that to say, we bring different “life knowledge” into our marriage, and Ike has a lot of farm know-how that he shares with me. Yesterday was one of those days. While Ike was paying for parking, he noticed a mother hen with some baby chicks nearby. I don’t know why they were there, but he called me over to see them. Unfortunately, by the time I reached him the chicks were nowhere to be found. Where had they gone? Underneath their mama. You can see a picture of the mother hen to the left. 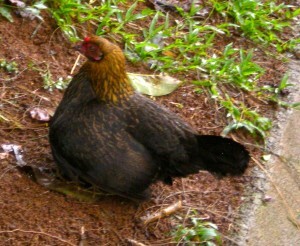 Although it’s hard to tell, there are about half a dozen baby chicks underneath her wings. If you look closely you might notice two little feet sticking out near the front, but the rest are hidden. That mama hen did NOT want us going near her babies. Until yesterday, I didn’t know that mother hens did this. If Ike hadn’t told me, I would have assumed the babies were hiding in the bushes nearby. Ike also told me that if we were to venture any closer to the hen, she would engage in a defense mechanism called “flogging.” It’s when the mother spreads her wings and runs at you in a threatening way. Ike said he could demonstrate by provoking the chicken, but he honestly didn’t want to. Even though she’s just a little chicken, he said that flogging is genuinely scary. Mama chickens know how to guard their young. Likewise, Psalm 17:8, 36:7, 57:1 and 63:7 all describe the refuge we can find “beneath the shadow of your wings.” It is a metaphor that I have always struggled to fully understand, but now it makes perfect sense. In nature, it is an inherently protective posture assumed by a mother for her children. The symbolism here is so rich. In addition to expressing the nature of God’s protection over us, it also sheds light on the imago dei in women. Although men are traditionally construed as the “protectors,” I think we all know how fierce women can get with their children. In fact, you don’t have to be a mother to experience this instinct. I don’t know about you, but even if I see a stray child at the mall I go into “mama mode.” I start thinking, “Where is that child’s mother? Who is watching that child? Do I need to intervene?” And sometimes I have. I’m sure some men have that instinct too, but I suspect there is something about that female instinct that Scripture intentionally meant to infer. I mean, who hasn’t heard those crazy stories about mothers who suddenly acquire super human strength and pick up cars in order to save their children?? God is fierce over us. He will take us under His wings and defend us with all the ferosity of a mama hen. I love that about God, and I love that I can know Him better through that instinct in my own heart. I was laughing out loud! Are you surprised? :). Great post! I am glad you decided to share. Nice job pulling the gospel lesson from what you saw in the hen’s behavior, Sharon. It’s great how God uses such concrete images to show us his nature. Funny, but I was just citing the verses where Jesus longs to gather Jerusalem as a hen gathers chicks in a Bible study I wrote this weekend. The main passage is Psalm 127 where we’re told that we watch in vain unless God watches over us, and that made me think of Jesus standing over Jerusalem. I think the two pasages go together, at least I hope so. P.S. Oh, and don’t feel bad about not knowing about the gathering chicks thing. When I was in college I dated someone who didn’t know chickens either. We saw some somewhere and I noticed one was missing feathers on the top of its head and there were a few fresh wounds there too, so I said that this chicken must be at the bottom of the pecking order. My date thought I was making a joke until I explained that chicken behavior is where we got the phrase in the first place. Learn something new every day, I figure! P.S. I wasn’t sure if poultress was a word until I googled it just now and found that link. I loved this post. Thank you for sharing about the mother hen side of God. Fierce! What a wonderful insight, thank you for sharing. I just love it when God ties real life pictures into our understanding of scripture. I did not know this of hens either but can understand now how this relates to the Word. In the shadow of you wings…I sing for Joy.